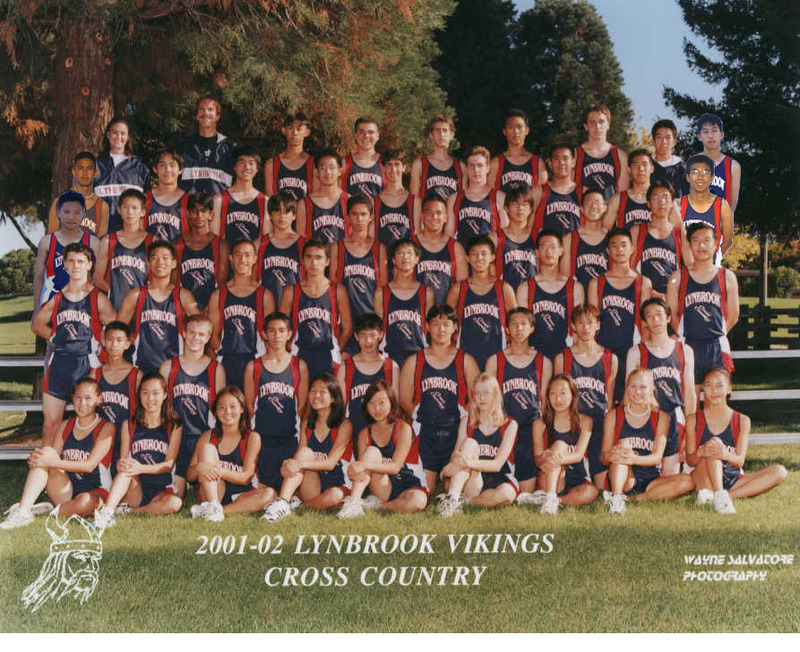 2002 Track Time : I'm closing off XC for the year - any new posts can be found on the 2002 Track page, just hit the link and set a new BOOKMARK. 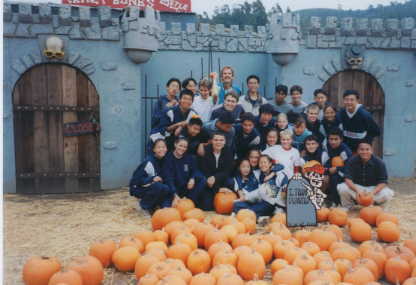 Great American XC Race : will not be coming back to San Francisco in 2002 - only one event in NC. The Harrier : names Ruth Graham (Gunn HS) as an Honorable Mention on their All-American Team - way to go Ruth. All CCS Team : Published in the Mercury News. Echoes Of Footprints : Racing Through the Years at Crystal Springs. A book researched, written and compiled by Michael Elsesser & Bob Rush covering the last 30 years of Crystal. DVC All-Comers : Coach Cruz at DVC is hosting All-Comer track meets over the Xmas break. All NorCal Lists : headed by Leal and Trotter as NorCal Runners Of the Year. Lee Evans, a two-time Olympic gold medalist who attended Overfelt High School and San Jose State, will coach South Alabama's track and cross-country teams. Evans set a world record in the 400 meters in the 1968 Olympics that stood for more than 20 years, and also was a member of the 1,600 relay team that set a world record. Jeff Johnson (Nike) : talks at the "Border Clash" Banquet the night before the race (a race between Oregon's best and Washington's best HS XC runners). It's a bit long so have 10 minutes of free time. Qualify Guesstimate : into CCS Track Finals. A look based on LAST years info, by Ernie Lee (Gunn HS). 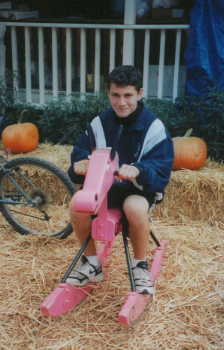 Saratoga News : covers Saratoga XC team success and Will Kraemer. Track Returnees : Sorry, I don't do the 800 or girls 1600 (maybe this year though), but here's a look of those returning that are in the CCS Top 100. The girls 3200 has the most. Steeplchasers : DVC is hosting All-Comer Meets with... the Steeplechase, great way to get some experience. Xmas Relays Back On!! : With lots of help coming forward and runners just not wanting to let this event die, the Christmas Relays are back on. Ruth Graham (Gunn) & Will Kraemer (S'toga) : are both the SJ Mercury News Athletes Of The Week. 2002 CCS At-Large Standards : If Walt did his math right (and the rules aren't changed), we have the Standards for next year. An interview : with Gunn HS Junior - Ruth Graham. Her thoughts on State, running and future goal. CCS Champs : Lynbrook Boys do it again. 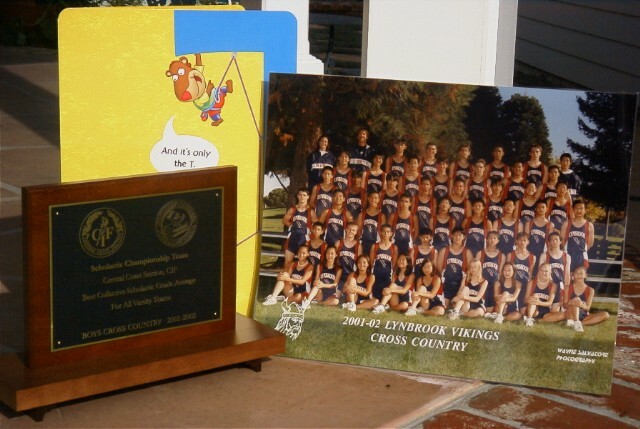 For the 2nd time in 3 years, Lynbrook is the overall CCS GPA champ in XC! Saratoga News Article. San Jose Mercury : spells out the story for the two CCS athletes that win State. Xmas Relays Cancelled : Runners - After 27 years the WVTC Christmas Relays have been cancelled - pass the word. Saratoga News : Write up about CCS and State preview for Saratoga HS. End Of Year Party : Team - thanks for the year (and the teddy). Evan & guys - behave yourselves. 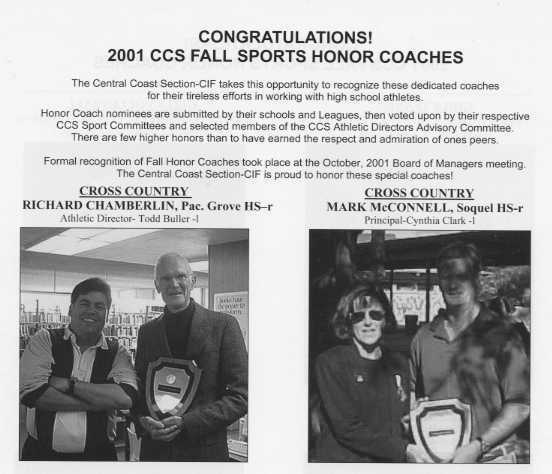 XC Honor Coaches : The CCS office has selected Mark McConnell (Soquel) and Richard Champerlin (Pacific Grove) as this years Honor Coaches - Congratulations. All Comer 2 Mile : Who's up for a 2 mile race on the track? If you want to race, check it out. San Jose Mercury : lists Melissa Grelli (Presentation) as Athlete Of The Week. Nine other XC runners make the Honor Roll. CCS Finals : Guys take 10th in Div 2 with Berson, Katz, Chang & Hao all getting PR's. Wakabayashi also PR's by another 13 seconds in the D2 girls race. SJ Mercury also covers the event. San Jose Mercury : One year later, after a horrific car accident, the NMC Girls are back - ready to go at CCS. Saratoga News : Saratoga HS gets ink from the local paper. CCS Team Estimates : Take a look and see how your team will do at CCS if everyone runs the same as their best race of the year. CCS Team Qualifiers : In case you'd like to see what CCS Teams are going to Section finals, by Division. BlackFab Grants : Congratulations to those recipients of the grant $'s. Mile Time Trial : Wang, Choi & Goslicka set the biggest PR's at this annual event. 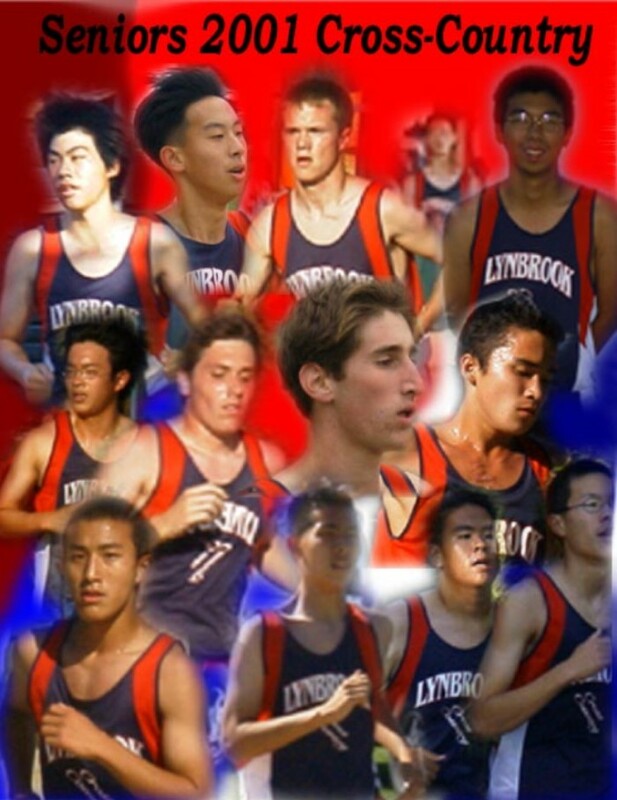 Saratoga News : Lynbrook Invite, St Francis Invite - Saratoga & Lynbrook kids get lots of ink from the local paper. SCVAL (DAL) : Varsity Boys, led by Jeff Whitsett, qualify on to CCS. Aya Wakabayashi qualifies as an individual, as the Girls finish 5th. F/S Boys take 4th while JV Boys finish 2nd. SLV Article : More news coverage for CCS schools. Coaches : Rain date for League meets at Crystal is Fri (11/2) - be flexible - Varsity races get priority. $50 fines for busses turning around @ end of Hallmark, and for people being up by the water tank area. Center Meet #3 had $200 in tickets getting handed out. 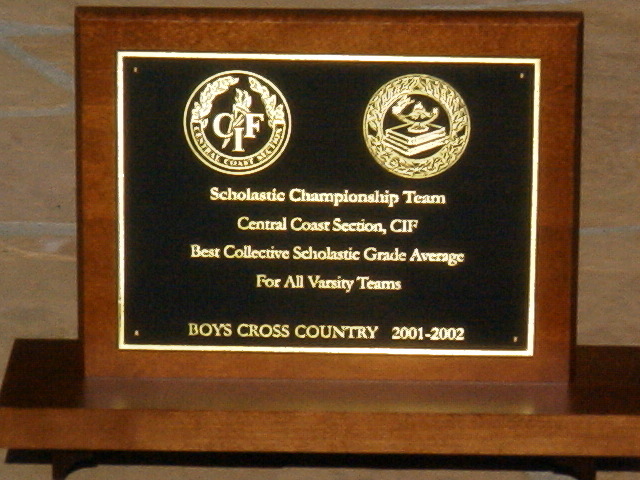 Lynbrook Invitational : Which also doubled as the FUHSD District Championship (last run in 1993). VB took 4th while the VG & JVB each came away with 2nd place finishes! Hyan Kim wins the JVG race, while Jeff Whitsett & Allen Chang are District Champs. HMB "Review" : The local paper gives the HMB Cross Country team some ink. Uniform Rule : Coaches - be sure you are aware of the uniform rule for Post season, they are serious about it. St Francis Invite : Whitsett, Katz, Lee, Wakabayashi all earn shirts while others get PR's (and some even get lost :). Saratoga News : Crystal Springs Center Meet Coverage. Coaches @ Serra Invite : I have created WMV files that I try to keep to 1 min in length (~8 Mb). It takes about 5 minutes to download with DSL (I wouldn't try with a modem). They play better if you download Vs trying to play from the web (click here to see how that's done). Let me know what you think. If it's not well received I'll skip doing it. View the Championship Boys and the Varsity Girls. Enjoy. Crystal Springs #1 : Alot of folks get their first look at Crystal. Berson & Lee both PR from last year. Saratoga News : Covers the Stanford Invitational and Will Kraemer of Saratoga gets some good ink. Shannon Rowbury : is the Mercury News Athlete of the Week. 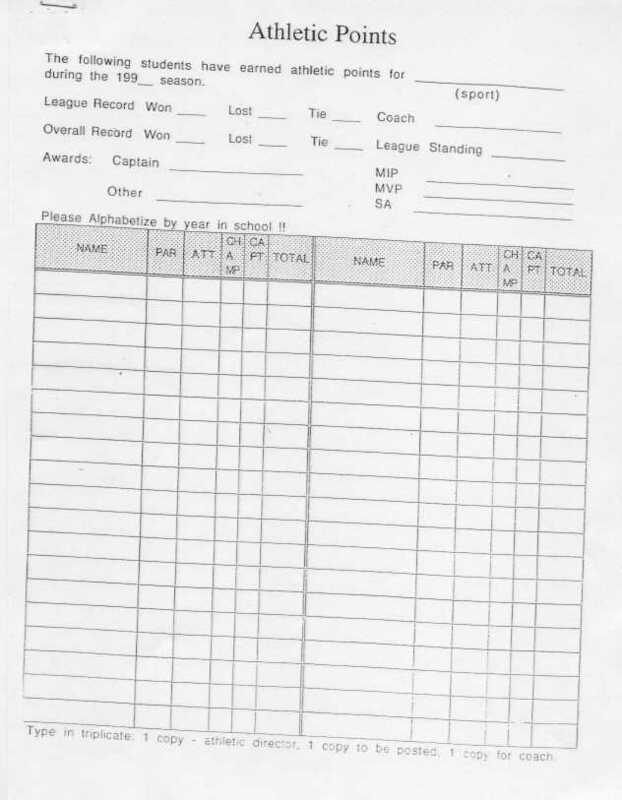 CCS Track Proposal : Coaches: CCS is proposing to eliminate the North/South sub-section Track meets for the 2002 Track season. Discuss this with your AD. BlackFab Grants : The deadline to submit is this Friday (10/12) ... don't miss out on the $'s. Artichoke Invite : F/S Girls rock! The team of Wakabayashi, Kim, Smith, Ju, Lee and Goslika took 2nd place - a mere 6 points away from first. Rallye Run : For the first time, ever, there was a 3 way tie for first (and no one filled out the tiebreaker). Ruth Graham : of Gunn HS is SJ Mercury Girls Athlete Of The Week. Stanford Invitational : In their second Head-To-Head competition, Whitsett gets the nod over Berson to even the score. Wakayabashi closes to withing 3 seconds of Francine Lee. Joshua Wong has the biggest improvement of the day as compared to his last XC race. Saratoga News : Covers the Central Park Invitational. Central Park Invite : Jeff Whitsett and Francine Lee continue to have strong races. Both medal, both PR, both have the fastest Lynbrook times of the day. BlackFab Grants : The application period has been extended. Check it out to get $'s for your program. Saratoga News : Covers the Saratoga Invitational. Saratoga Scrimmage : Whitsett, Lee, Berson, Meyer & Ju lead Lynbrook in this 8 team meet. VG & JVB finish 3rd while F/S take 2nd. 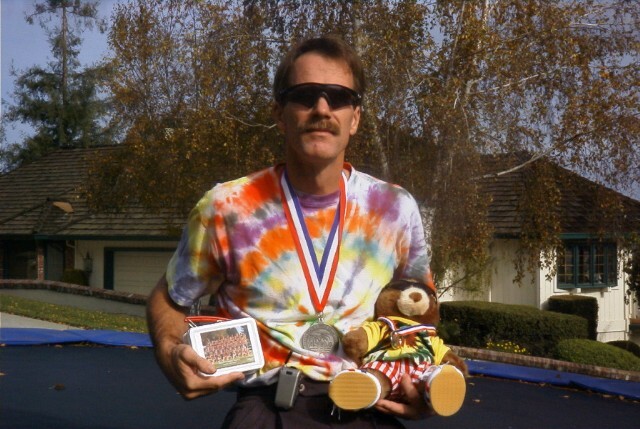 Jim Hunt : Coaches: Good article by Jim Hunt (Humbolt) in this months Cal Track Running News. Firebird Invite : Eugene Berson & Morgan Katz lead the F/S Boys to a 2nd place finish. Jeff Whitsett, Francine Lee, Hyan Kim, Jeyvel Pandian & Michael Change all win medals. Great American XC : Berson & Whitsett lead the guys in a meet with "The BIG Boys", while Lee and Wakabayashi do the same for the ladies. Lynbrook Center Meet : Jeff Whitsett wins the Varsity Boys race - Eugene Berson takes the F/S race - Aya Wakabayashi finishes 6th to lead the Lady Vikes. 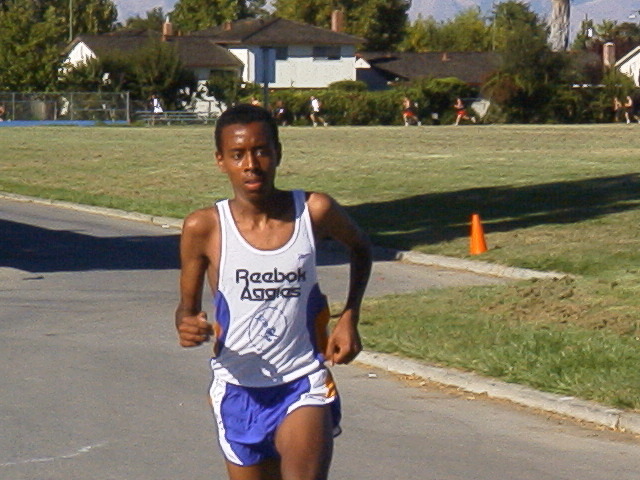 Giliat Ghebra, unofficially, runs the 2nd fastest time ever on the Lynbrook Course. Parents Meeting : Starts @ 7:00 - Wed (9/5) in the Lynbrook Library. SCVAL Meeting: SCVAL Coaches: The Pre-Season meeting is scheduled for Sept 7 (5:00) at SF HS. At-Large Standards: The State At-Large Standards have been computed and submitted to the CIF office for approval. These are just proposed, not yet finalized. Team Comparisons: Taking last years best Crystal Time and Mile/2 Mile from track, we have a Team Comparison by Division. We hope to update it on a weekly basis. 4x1 Mile: UPDATE: They got it! Click on the link for story and video. 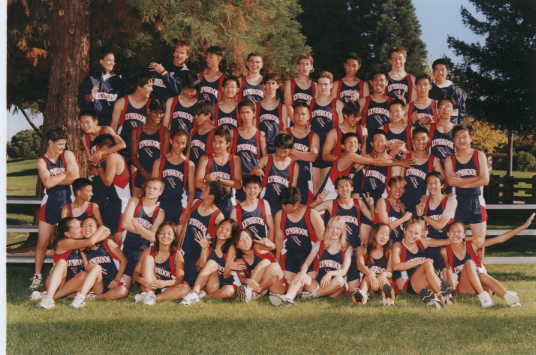 The Master Aggies are going to take another crack at breaking the current World Record at the Aug 2nd, Los Gatos AC meet. Update#2: Time to start thinking XC. Let's get in shape so we can have a terrific season. Shannon Rowbury: Nice interview with Rowbury in the July/August issue of Calif Track & Running News. LG All Comer: Weekly RESULTS from the All Comer meets. State Previews-Boys&Girls: Prep CalTrack does their first pre-season look at Top Teams and Individuals - Boys&Girls in Cal. Entire PREVIEW page. Antwon Guidry: Cal-Hi's Athlete of the Year - Webb qualifys on. 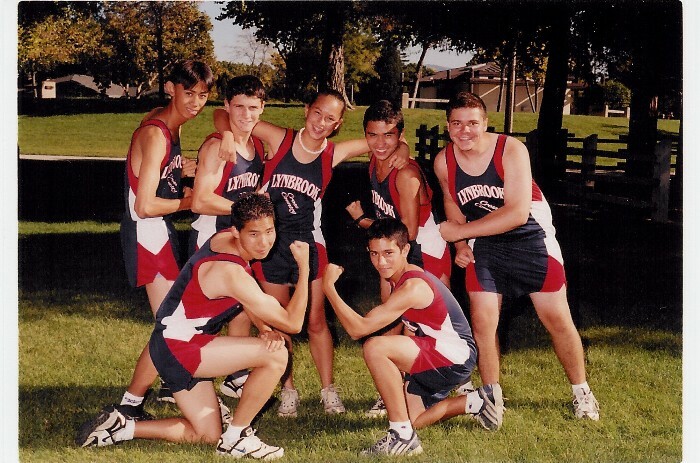 Update#1: Welcome to Lynbrook XC. See what's in store for the summer and next fall. Summer WorkOuts: If people are interested in continuing track workouts thru the summer, click here. Jr Ag's: Check out what's going on this summer. Potentional members ... we're looking for you as well! 300/500: Mile Club. Join the club and be ready for XC. 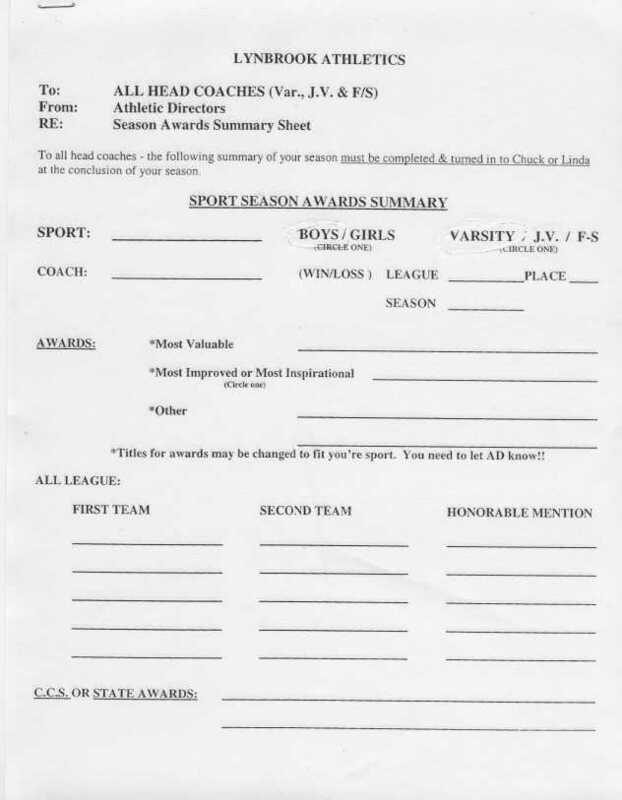 Steve Anderson: of Homestead HS is goint to a running camp/steeple chase camp in July at Humbolt State U. (Arcata) July 22nd-27th and can take 4 athletes. Call him at (408) 249-2780 if interested. XC Starts : On Aug 20th (Mon @ 9:00 AM) - I'll still be in England but the Assistant Coach will be there.